Once you have added a DOJO Bar banner and link to your website, we’d really appreciate it if you could post the page link to our Facebook page too so we know and can thank you! Banner 3: A 3 image GIF showing a little more of the great atmosphere at the DOJO Bar! The DOJO Bar special tour package – a 1 day guided tour of the famous Orion Beer Factory WITH FREE TASTING followed by a tour of The CHUKO awamori distillery – a family owned business producing some of the finest Okinawan sake available today AND again WITH FREE TASTING. CHUKO also make their own clay awamori pots along with shisa and other traditional pottery which is all available at discounted factory prices on site (cheaper and more original than what you will find in the stores in Naha). ***UPDATE*** – We can now add in a visit to the world famous Churaumi Aquarium plus an option to drop into the Pineapple Park too! Its a slightly longer day and earlier start (leaves Naha by 8am) but well worth it as these are two of the most popular attractions on the island. The total cost for the day including these 2 bonus stops is 5500 – 6000 yen depending on group numbers (for groups of 20+ we can negotiate group discounts on entry tickets). This 1 day tour includes bus hire, driver and English/Japanese speaking tour guide and a pre-arranged stop for lunch. Usually there is also an opportunity to stop along the way for some souvenir shopping too. Typically leaving Naha at 10am and returning by 6pm. Pick up/drop off at your hotel or The DOJO Bar. Prices are typically around 4000-5000yen per person (excludes lunch) but this can be reduced if we get early bookings and can negotiate a better price with the bus companies well in advance. Please contact James @ The DOJO via the DOJO Bar contact page or FB message with enquiries and bookings. Check out the pictures from our recent tour – what a great day! Here are some questions on The DOJO Bar prepared for Japan Update. Q: First…address…operating hours…menu and prices…$ Y Credit Cards…parking…full name of owner. 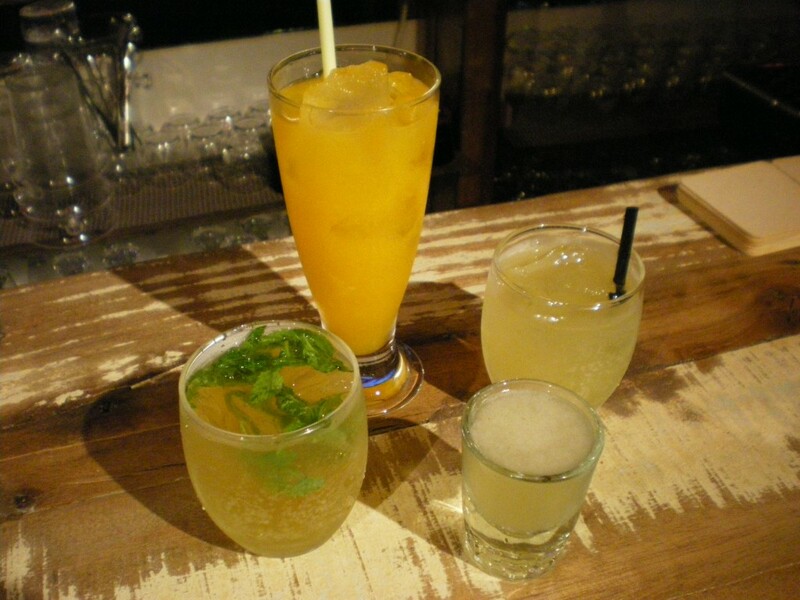 The bar is located at Asato 1-chome if you search on a Japanese map, which is also the intersection of routes 29 and 251. The full address is Naha-shi, Asato 101, 1F. Look for the blue neon DOJO letters on the corner of the building and the giant karate figures! Open 7 – 1 Sun, Mon, Tues, Weds, Thurs and 7-2 on Fri and Sat. A few menu highlights include cocktails from 700 yen, draft beer from 400 yen and wine by the glass from 600 yen. Also a selection of Awamori if you fancy a taste of the local alcohol. Payment accepted in Yen or Dollars (at the daily spot rate). Credit cards also accepted. No free parking at the bar but cheap coin parking is nearby. Q: What prompted you to decide to open a bar? It just seemed obvious that Okinawa, the home of Karate, needed a karate theme bar where karate enthusiasts and others could enjoy a fun and interesting experience built on good food, original drinks and a good dose of local history and culture. I worked in the bar trade for years in Europe, the UK and Japan so it’s fun and challenging to get back behind the bar and entertain Japanese and foreign visitors alike. Q: How did you pick this location? Its less than 5 mins walk from Kokusai Dori and very near Shureido, the major karate store, and several major dojos in Naha. Plus it’s really easy to find being on the corner of a major intersection (routes 29 and 251). Q: What was the motivator that made this a special place? I had a vision of creating a place where Okinawans and foreigners alike could meet and relax, exchange experiences and make new friends. And in fact, on our opening night, when we had over 100 locals and travelers in the bar, I had 2 senior karate teachers tell me they loved the place because they could relax and talk here in a way they couldn’t at other events and meetings. That really made me very happy to hear that. 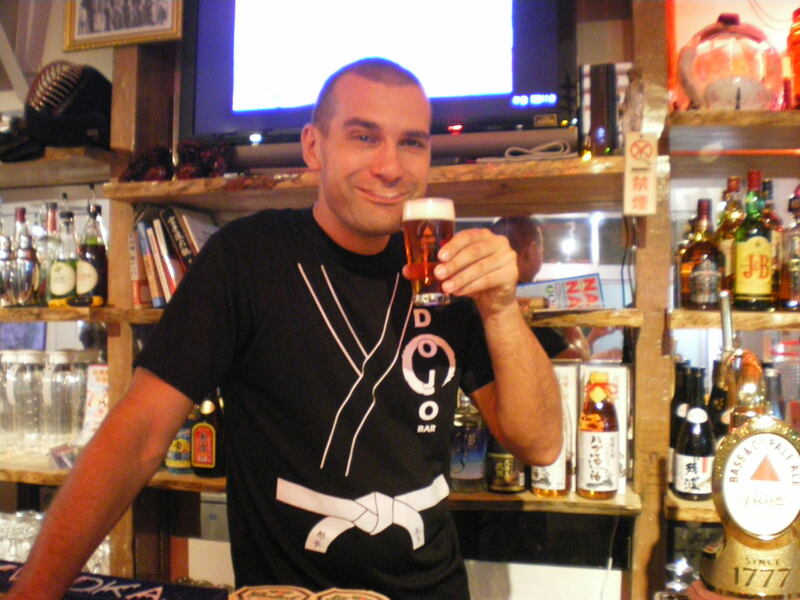 I’ve also had many Japanese tourists comment on how they like the DOJO bar as they get an insight into a side of Okinawan culture which is often harder to find. And they love the original cocktails! 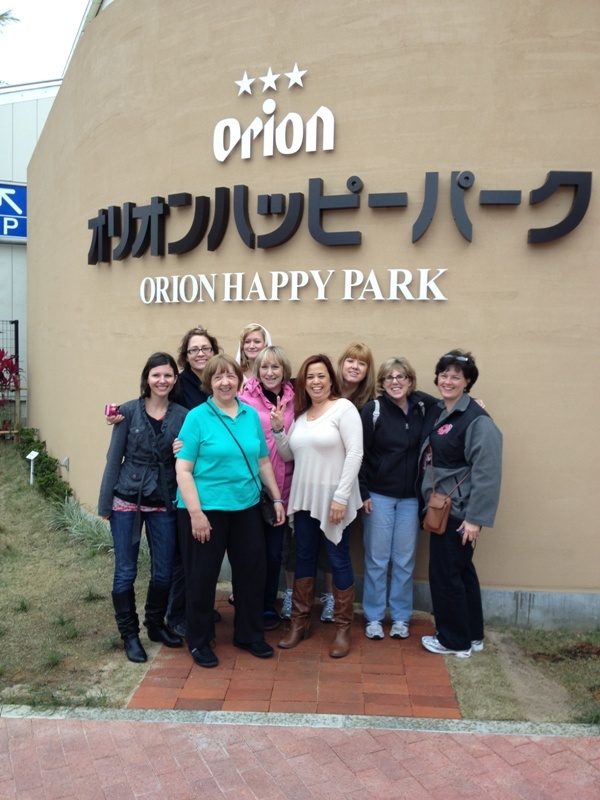 Q: An American in the restaurant business in Okinawa isn’t your typical job, vocation or career. Well, I’m English so I guess that’s even rarer here in Okinawa! But I’ve been visiting Okinawa for years now and moved here permanently 4 years ago so I’m quite used to things here. There are some challenges of course but being unusual can also be an advantage sometimes. Q: What are your ideas that make The DOJO Bar something different from other places? If you are into karate the DOJO offers a unique atmosphere and access to local karate knowledge (teachers, dojos, etc) that can be invaluable. We are happy to help with information about the islands and the best things to do and see. And we offer an international menu, whether its imported drinks, original cocktails or fusion food using the best of Okinawan local produce served in innovative ways. Q: How does the cooking work out for you? I love to cook and we are constantly experimenting with new dishes, new combinations of Western and Okinawan recipes. I’m learning as much as I can about the local food and how to cook it. By doing that I’m coming up with new ideas all the time. Q: How did you decide on a menu…choosing what’s available? It’s an ever-changing combination of the seasonal ingredients and new recipes we try and like. It will never be set in stone but always change with the seasons. But we have a small kitchen (we are a bar not a big restaurant) so we have to choose our dishes carefully to make up a small but interesting menu. Q: What are your best sellers? Drinks – Orion of course, but also recently Bass Pale Ale, a very tasty English ale, and our Habushu cocktail, the “Ichigeki”. Habushu being the snake-venon enfused sake famously from Okinawa. On our food menu all our pizzas are very popular. Q: With the bulk of your clientele being Okinawan…what’s the reaction when they realize the boss is a gaijin? Some are surprised, but when they realize they can speak Japanese or English with me equally easily they don’t worry so much. Most are very interested in meeting a foreigner who has so much interest in their local traditions and culture. And some take advantage of the opportunity to get English language practice for free (well, for the cost of a drink at least). Q: How does language fit into your lifestyle? Any problems? My Japanese is reasonably good so most daily things are not a problem but I need to learn Uchinaguchi (Okinawan language) so I can understand my karate sensei and older Okinawan customers better! That’s my next language challenge! My wife helps out from time to time but she is usually very busy with her sweet shop (www.jahanakippan.com). My daughter wants to work behind the bar with me but as she’s still only 9 I’m afraid she has to wait a few years yet! Q: Where do you see BAR DOJO being say…one year…three years…five years from now? 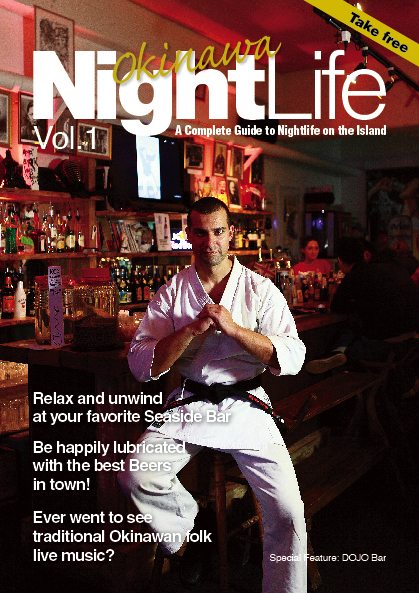 I hope that the DOJO Bar becomes a landmark for visitors to Okinawa and a firm favourite for locals too. If it’s a popular idea then maybe I’ll open another one! I like meeting people and learning new things. I hope the DOJO Bar continues to be a great place to keep doing that for a long time to come. 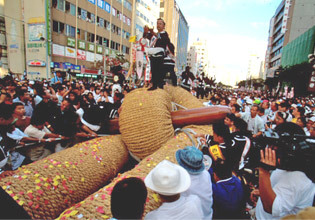 Sunday Oct 12th 2014 sees the Naha Otsunahiki (tug-of-war) on route 58 in Naha from 2:30pm – you really can`t miss it!! Join in and pull, pull, PULL!!! We`ll be there in DOJO BAR t-shirts so grab a flyer for a free drink at THE DOJO afterwards. Or bring us a piece of the rope and also get a free drink! That`s right free drink for old rope! See you Sunday, open from 6 – late. Get dressed up in your best summer kimono and come down to the DOJO this Saturday – lets celebrate Misaki-chan’s birthday in style! 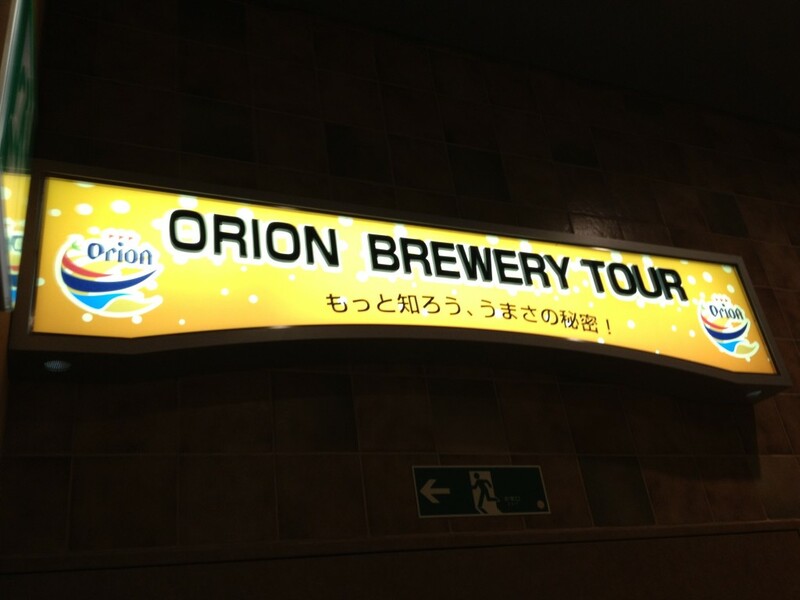 There’s a free food buffet and Corona beer is only 700yen for 2 bottles. Plus we got PIMMS by the pitcher for just 2000yen – the quintessential English summer tipple. 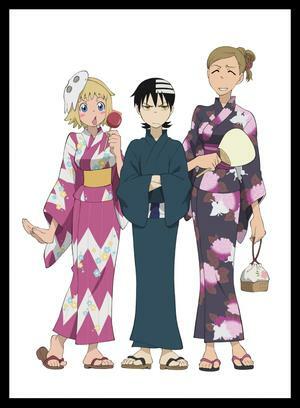 And there’s a prize draw for everyone in Yukata. Its gonna be awesome! This weekend Okinawans are observing the Obon festival when the spirits of dead ancestors are believed to return to the family home to visit their descendants. Okinawan families get together to enjoy the company of the living (and the dead) and many people take a little time off over this weekend and relax.